Just because the spring weather is arriving, it doesn't mean you have to get off your couch and stop binge-watching Netflix. In fact, the streaming service has just revealed its April schedule of new titles to keep you living room-bound well into the warmer months. 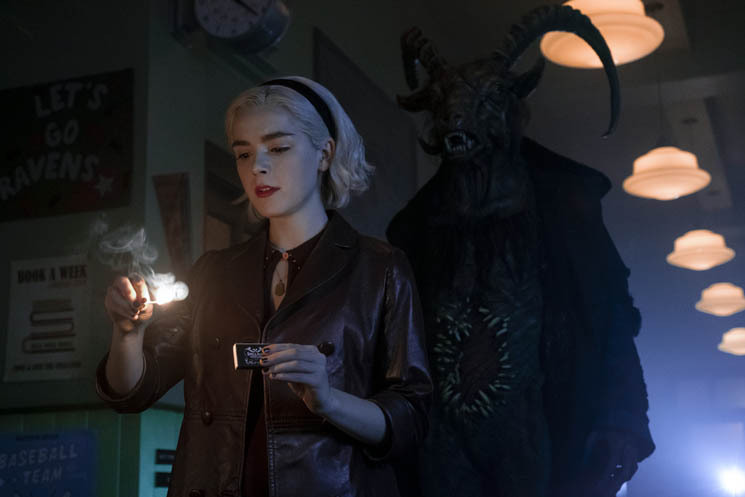 The Chilling Adventures of Sabrina returns for the spooky second part of its first season on April 5, which finds the titular witch torn between her mortal boyfriend Harvey and the brooding bad boy warlock Nicholas Scratch — all while the devil wreaks havoc on Greendale. Other Netflix original series hitting the service next month include Chambers (April 1), Our Planet (April 5), Persona: Collection (April 5), Roman Empire: Caligula: The Mad Emperor (April 5), Season 8 of Spirit Riding Free (April 5), Tijuana (April 5), You vs. Wild (April 10), Black Summer (April 11), Mighty Little Bheem (April 12), Special (April 12), No Good Nick (April 15), My First First Love (April 18), Brené Brown: The Call to Courage (April 19), Season 5 of Cuckoo (April 19), Season 2 of Samantha! (April 19), Grass Is Greener (April 20), new episodes of Selection Day (April 22), Bonding (April 24), Season 2 of The Protector (April 26), ReMastered: Devil at the Corssroads (April 26), Street Food (April 26) and Yankee (April 26). As for Netflix original films debuting next month, you'll be able to watch Suzzanna: Buried Alive (April 3), Unicorn Store (April 5), A Land Imagined (April 12), The Perfect Date (April 12), The Silence (April 12), Who Would You Take to a Deserted Island? (April 12), A Fortunate Man (April 19), Music Teacher (April 19) and Someone Great (April 19). There's also lots of new comedy specials arriving, including Kevin Hart: Irresponsible (April 2), Huge in France starring Gad Elmaleh (April 12) and Anthony Jeselnik: Fire in the Maternity Ward (April 30). If animated fare is more your cup of tea, there's new anime on the way too, like Ultraman (April 1), Rilakkuma and Kaoru (April 19), Baki: Part 2 (April 30) and Ingress: The Animation (April 30). Unfortunately, some titles will be disappearing over the next few weeks so be sure to catch Downton Abbey and The Gift before they leave on April 1; Dawn of the Dead before April 3; Star Wars: The Clone Wars and Star Wars the Clone Wars: The Lost Missions before April 7; Captain Phillips before April 21; Big Eyes and Captain America: The Winter Soldier before April 24; and Ocean's 11 before April 29. Watch a trailer for the incoming April titles below.